Available now is the vacuum tool module that has over a 96% debris pick up rating for both carpet and hardfloor. Coming in the first quarter of 2019 will be the sweeper tool module, which is designed specifically for hard floor debris pick up but can also be used on carpet. What are the benefits of the interchangeable tool system? Rather than purchasing multiple floor cleaning units, this interchangeable tool system allows you to purchase one main chassis and multiple interchangeable tools for various types of flooring and the proper cleaning solution for each. This cuts costs, saves space, and is twice as useful as a machine limited with one tool inside. How easy is it to change the tools? The tool modules are sold with their own trolley used to store and move the tool module while it is not inside of the main unit. The trolley is designed with tracks on which the tool sits that directly line up with the same tracks on the hollow inside of the robot’s main chassis. To remove or insert a tool module, simply line up these tracks and slide the tool in and out of the main chassis. Are the main chassis operations affected by the tool change? The tools operate independently from the main chassis. All tools are compatible with all main chassis. 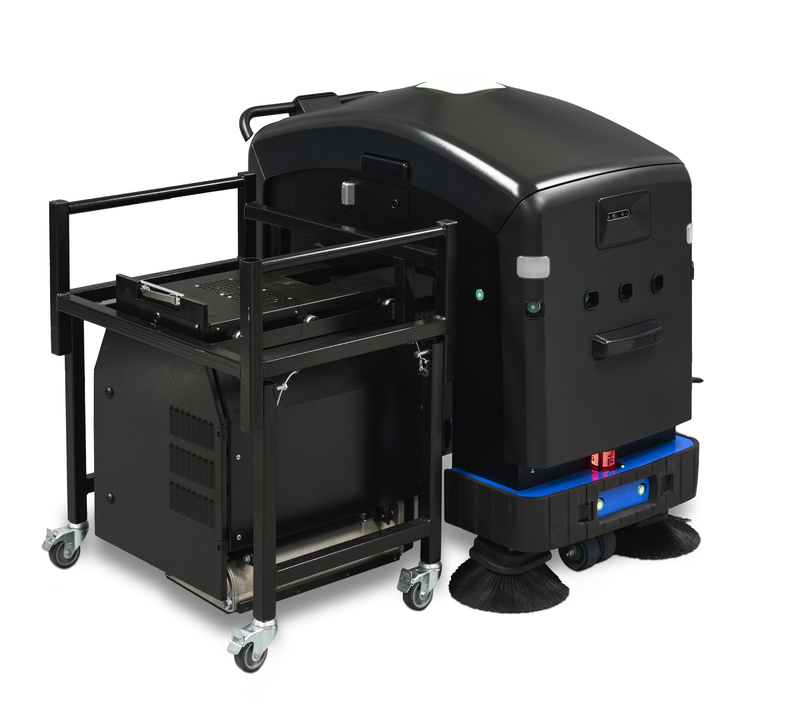 Individual tool modules can be purchased at any time to replace or add to the fleet of floor cleaning tools.The only aspect of the main chassis affected by the tool change is the battery life. Lithium batteries are a type of rechargeable battery that work by moving lithium ions from negative electrodes to positive electrodes while discharging power, then move the lithium ions the opposite direction while charging. This kind of battery is used in many large, electric machines such as hybrid cars and self driving cars. These batteries generate power through chemical reactions between lithium, nickel, manganese, and cobalt. The strong reaction that occurs causes currents to flow between the positive and negative poles, creating an electric charge. 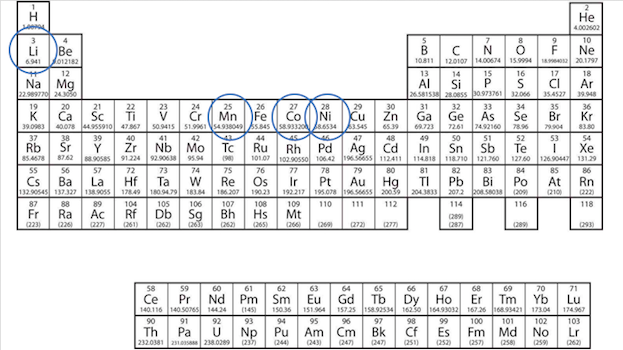 The key to success lies in the combination of nickel and manganese. Nickel is known for having high specific energy but has poor stability. On the contrary, manganese has low internal resistance, resulting in high stability, as well as a low specific energy. Combining these two metals enhances each other strengths. How long will the battery charge last? The battery life varies depending on which tool is installed in the machine. The vacuum tool pulls more power and lends itself to an 8-hour battery life. 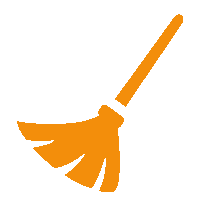 The sweeper tool requires less power and will last as long as 10 hours. Unlike traditional lead-acid batteries, the lithium ion batteries can be recharged many more times. The number of recharges will depend on the tool being used and the amount of daily operating times. Typically the FX250 batteries will last several years, even under extreme use. In the autonomous cleaning mode, the FX250 will cover over 95% of the task area assigned, not including underneath furniture or any major architectural barriers. Using an overlapping lawnmower pattern and wall following in a mapped area, the FX250 will provide a complete clean while also avoiding any and all obstacles. What is an overlapping lawnmower pattern and how does it help during full coverage? While cleaning a task area, the FX250 moves in full passes from one end of the space to the other. The unit then turns in place and continues to make another pass in the other direction, taking care to overlap 10% of its previous footprint. This process ensures that there are not gaps in the task area that is being cleaned. What is mapping and how does it help the FX250 perform better? Our mapping process entails gathering location information so that the locations and attributes of the space can be exhibited using 2 dimensions: latitude, longitude. 2D LiDAR survey data is more accurate and economical than traditional methods. All of these measurements can be taken with ease, generated into maps, and stored in the FX250 for use at any time. How does the mapping process work? In order to generate a map of any given area, a LiDAR (Light Detection And Ranging) mounted on the main chassis sends out and receives back small pulses of light. Because the speed of light is a known constant, the area is precisely measured based on the amount of time those small pulses of light take to return back to the LiDAR. Any items within the area at the time are also bounced off of, giving the map information about furniture or other structures to avoid. This process is very similar to that of a radar or sonar. Once the area is measured, the plane is sliced at the height at which the LiDAR sits on the robot, generating the most accurate 2D map possible for the given area. What technology is used in the mapping process? LiDARs are standard on any autonomously moving machine from self-driving cars to autonomous floor cleaners in homes. Discovery Robotics’ Software Team has developed a patented mapping module that ensures accuracy and precision in the mapping process. After creating a map, does the robot ever need a new one? Initially, a skilled setup team will map all necessary spaces for the customer. Minor modifications in spaces are accommodated without remapping. The robot will store the map forever. However, if major changes occur, the customer can re-map the space with remote Discovery Robotics on-line assistance.